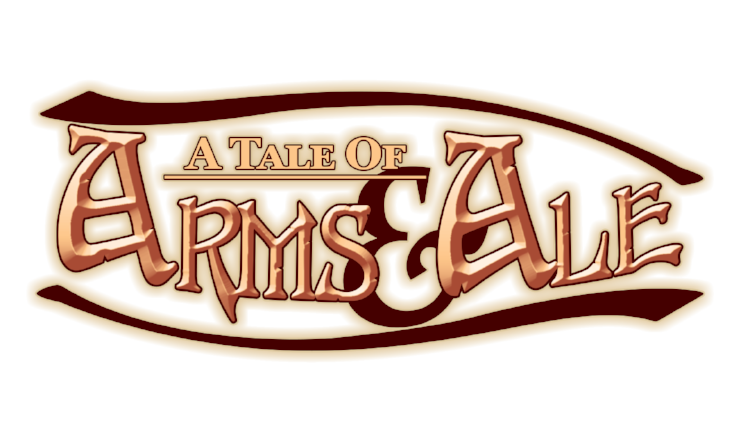 A Tale of Arms and Ale was my capstone project for Columbia College Chicago. My team, Those DARHNN Kids (The first letter of our names combined, we thought it was pretty funny) wanted to create a narrative game where the player could influence the story. Games we looked to for inspiration included Papers Please and VA-11 HALL-A. We wanted to combine the amazing narrative design of Papers Please and VA-11 HALL-A's approach to advancing the narrative through drink making and both games’ small cast of memorable characters. With that to start, we crafted a story where you are the owner of a tavern that is renowned as the place to be if you want to be an adventurer. Imagine you are the quest giver in any RPG, these people are coming to you for work. Some adventurers will tell your rumors of potential quests too that you can give out to future adventurers that come in. You are a tavern, so serving drinks is something you will be doing a lot, learning what your adventurers like and dislike will be essential to getting to know them. 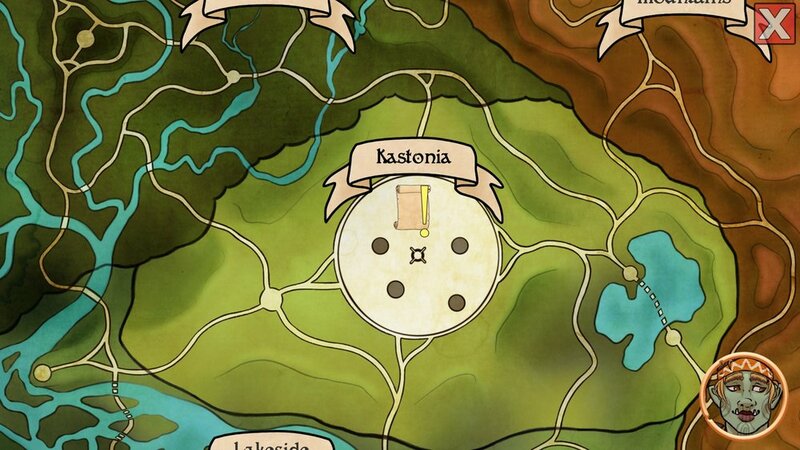 The tavern is located in the city of Kastonia, a large and prosperous city built around a mysterious tower, The Spire. The Spire gave the world its magic and prompted the establishment of four factions: The College, The Corporeal, The Artificer's Alliance, and The Eyes. They all hold political influence over Kastonia with different needs so disagreements are quite frequent. Some of your adventurers might be affiliated with these factions, so giving them work that conflicts with their values will anger them. The Spire becomes unstable though, and the factions are responding to this crisis in their own way. Who you choose to support will determine the fate of Kastonia. Arms and Ale was my teams first long-format project, we worked on it for well over a year. 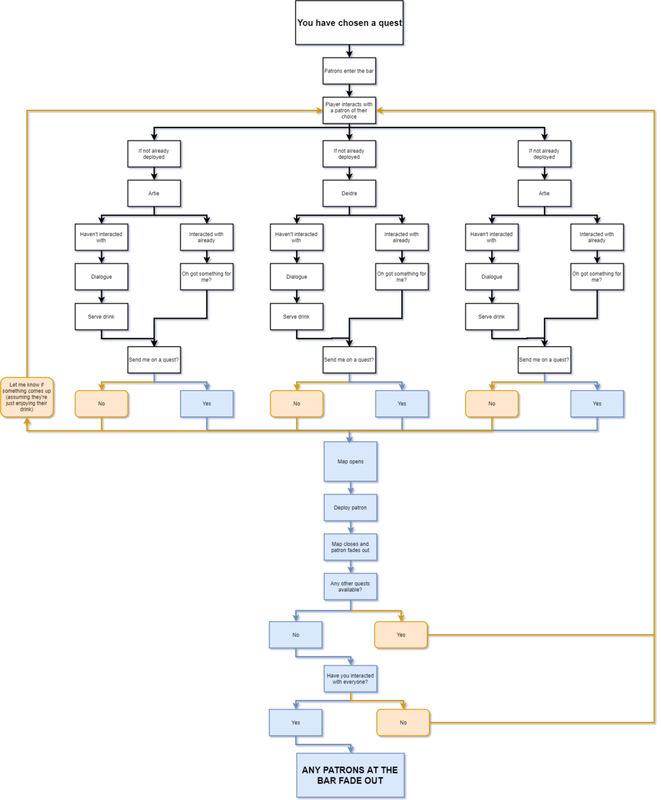 My position on the team was UI/UX Designer, so my responsibilities included creating mock ups, interaction flowcharts, and keeping the overall look and experience consistent. I worked very closely with my team's two artists to create fully realized final assets as well as acting as a liaison between Art, Design, and Programming. Below I will show the original mockups for the final version of the game but before getting into that let's look at how the various interfaces of the game evolved over A&A's development cycle. In the very early phases of development, we wanted to take the game down a more management heavy route for the gameplay. The game was much more frantic and was very difficult to tell a story since everything was on a timer, if you missed someone, that was it. 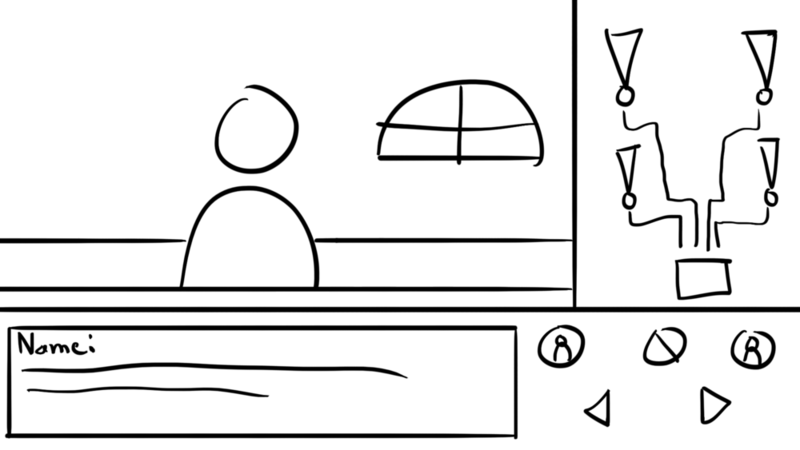 For the UI, we wanted to take a more minimal direction and keep the screen clear of elements as best we could. Additionally, we decided to have three characters potentially on the screen at one time so people would be phasing in and out. We eventually came to the conclusion that this really wasn't working out and only hurting the game, so we had to pivot. So we went back to the drawing board. 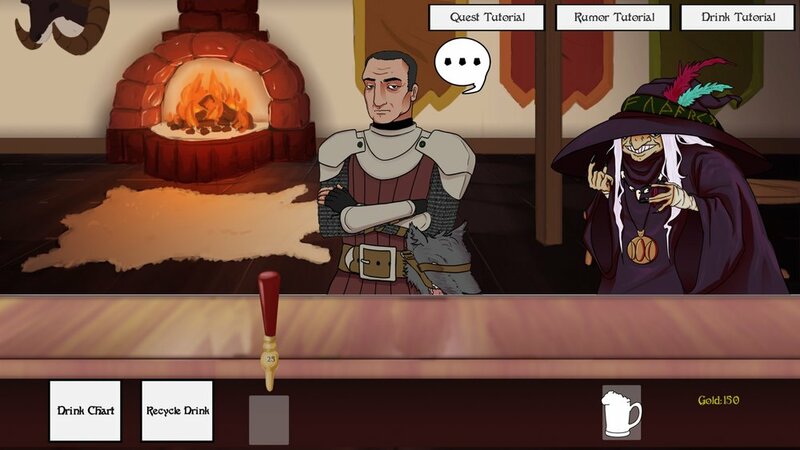 I spent a great amount of time on creating the current bar interface for the game that would make this less of a hectic game of serving drinks and talking to people and more of a game that's personal and emphasizes player-character interaction. This way we have dedicated UI space that's always on the screen. This direction is much more akin to visual novels in terms of style, but the level of interaction and involvement is much greater. In those two pictures above, there's slight differences between them and the current version. For example, we don't have arrows to move from positions in the bar and there was the addition of a drop-down menu and notification bar. So some things stayed and a lot of things left as we made this shift. We got that one-on-one interaction with the characters that we wanted, the flow of the game is much slower and more personal, and we were able to better tell a story rather than create a game with a lot of mechanics but no story. In the early version of A&A. Patrons would come to you with rumors and you would hold on to them till the end of the day. Once the day was finally over, you could decide how you would want to proceed with them. This was all done through our End of Day Manager which combined rumors, adventurers, and a shop that was later taken out. 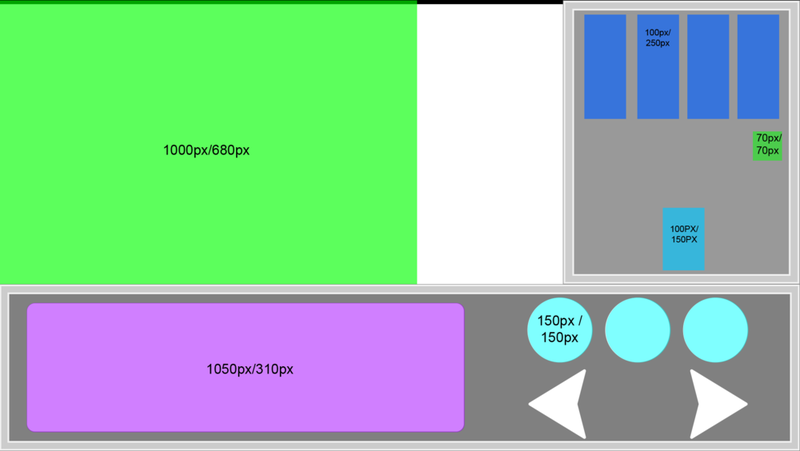 This as it is now is mostly the same but factored out into different things rather than a one menu for all things. The process of sending someone out was a bit too complicated too. You'd click on them if they wanted to go on an adventure, the map would pop up, then you would have to click on the dots to plan out a route that would end on the location of the quest. We then wanted to add more and more on top of it. Like for example if two patrons intersected they would join up or you could have someone hit multiple quests along the way before returning. It was too much and quite frankly it was getting too hard to explain it even to ourselves, so changes needed to be made. With the last pivot described earlier this was also around that time. So we decided that there's a lot less quests now, patrons only go to the ones they're assigned, and only one patron per quest. Our lead artist also got an official map made, so I wanted to make an interface that was clean and would present the map well. Now choosing quests was also changed with this. Instead of deciding what option you want to take at the end of the day, you'd decide right on the spot when a patron hands you a rumor. This helped the flow of the game tremendously now that you could get a quest and send someone out on the same day. 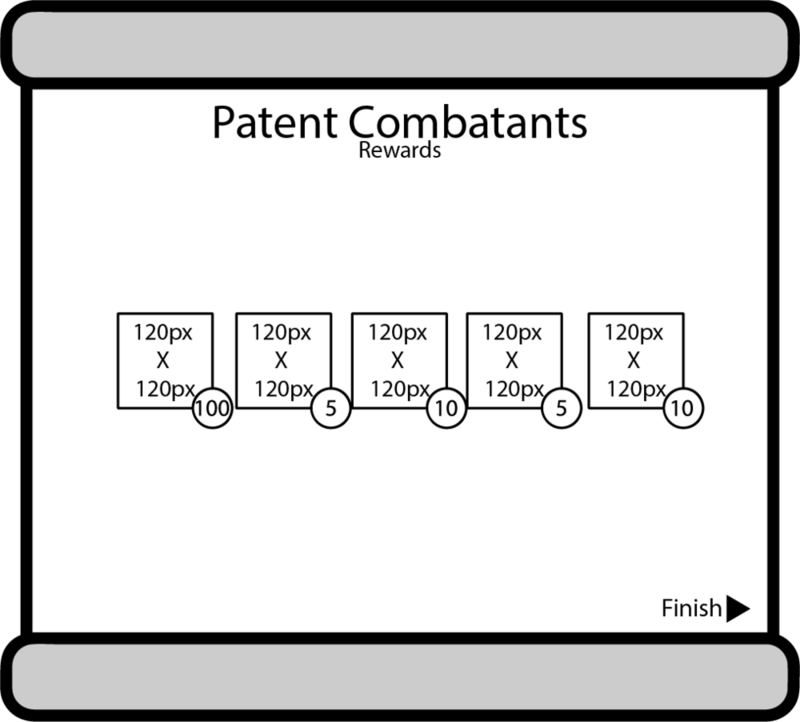 Finally, when it came time to start deploying people, we needed a method that would allow the player to plan out who they wanted to send out. During the early phases of this redirection, you would be locked into sending someone out on a quest if you talked to them. That proved to be problematic. So, I came up with a new way of patron interaction on the deployment phase. This new method helped us achieve our goal of allowing the player to strategize. Passing this along to the two other designers on my team, we worked together to flesh out this flow more. Last thing we changed was what needs to be displayed when the patron comes back from a quest. We didn't have this in our early versions of the game, so this didn't come along till we had our huge pivot. What we came to call as The Battle Report Manager didn't go through many iterations. Less to talk about here since the journal went through the least amount of iterations. The journal wasn't present in our early versions of the game. The content of it though was in our End of Day Manager, which you can view from the second topic in this column. When we had our big pivot for A&A, the End of Day did less and less as time went on as we started extracting out stuff from it into other things like the journal. The development of A&A was both incredibly fun and eye-opening. I learned a lot about myself and had an opportunity to expand my skill set. A&A is currently on hold, but I know myself and the team would love to go back to it and make it something bigger. Currently though we have A&A on itch.io! Which you can check out below.